David Silva has a passion for developing faculty and student talent, particularly in increasing opportunities for first-generation and minority students. (Dec. 11, 2018) -- Astronomer David Silva, director of the National Science Foundation’s National Optical Astronomy Observatory, has been named Dean and Distinguished Professor of the UTSA College of Sciences. He begins his duties March 1, 2019. Silva’s research focuses on stars and stellar systems, especially as tracers for how galaxies formed and evolved over the last 13 billion years. Since 2008, he has served as director of the National Optical Astronomy Observatory (NOAO), the U.S. national research and development center for ground-based, night-time, optical-infrared astronomy. At NOAO, Silva oversees scientific and technological research, development and operations at the Kitt Peak National Observatory and Community Science and Data Center, both located in Tucson, Arizona, as well as the Cerro Tololo Inter-American Observatory located in La Serena, Chile. In combination, these three centers provide a broad range of tools and services for observational and data-intensive research to the U.S. research community-at-large. In addition, NOAO has a strong education and public outreach mission, working closely with colleges and universities to train aspiring scientists and engineers and offering K-12 programming to promote understanding of the astronomical sciences. Silva’s role at NOAO also includes developing and maintaining strategic partnerships. In that role, he engages with philanthropic organizations, federal agencies including the Department of Energy, NASA and the National Science Foundation (NSF) and other U.S. and international research institutions. For example, Silva catalyzed a collaboration between NOAO and the Departments of Computer Science and Mathematics at the University of Arizona to develop the Arizona-NOAO Temporal Analysis and Response to Events System (ANTARES), a software infrastructure system to process tens of millions of alerts per night generated by astronomical time-domain survey programs. This ongoing collaboration engages professors, graduate students, post-doctoral fellows, research scientists, software engineers and systems administrators from both NOAO and the University of Arizona in an NSF-funded project. More recently, under Silva’s leadership, NOAO joined forces with the Thirty Meter Telescope International Observatory and the Giant Magellan Telescope Organization, two U.S.-based, international consortia seeking to construct extremely large next-generation astronomical observatories, to develop the U.S. Extremely Large Telescope Program. This trilateral collaboration intends to attract approximately $1 billion in funding from NSF to allow U.S. based scientists access to both of these observatories in the late 2020s and beyond. Such federal funding would leverage resources being provided by many other international and U.S. institutions and philanthropic organizations, including the University of Texas at Austin and Texas A&M University, which are contributing to the development of the Giant Magellan Telescope. Prior to his appointment at NOAO, Dr. Silva served from 2006 to 2008 as Observatory Scientist with the Thirty Meter Telescope International Observatory. Silva has served on the Thirty Meter Telescope International Observatory Board of Directors since 2013. From 1997 to 2005 he worked at the European Southern Observatory in Germany where he was responsible for data management and user support. He began his professional career at NOAO from 1990 to 1997, serving as a post-doctoral research associate then as project manager and astronomer. Silva earned his Ph.D. in astronomy from the University of Michigan and a bachelor of sciences degree in astronomy and physics from the University of Arizona. Since he joined NOAO as director in 2008, he also has held an affiliate faculty appointment in the Department of Astronomy at the University of Arizona. Silva says he hopes to collaborate with other researchers and administrators across the university to link astronomy and astrophysics with other disciplines focused on information technology, analytics and data science. “More generally, there is a growing excellence in data-intensive science at UTSA,” said Silva. “We’re in a moment in time when all scientific disciplines are confronted with the challenges of analyzing incredibly rich datasets that contain information about millions to billions of objects. I am eager to engage with students and colleagues within the College of Sciences and across campus with expertise in computer science, statistics, and machine learning to enrich and extend scientific research activities at UTSA, and thereby probe questions that simply were not answerable previously. Silva’s extensive experience as a researcher and collaborator makes him a strong fit for the dean’s position, said others. “David Silva shows a genuine excitement for UTSA, and he’s ready to be an integral part of the growth of the university,” added search committee member Brad Parman, principal of The Parman Group. 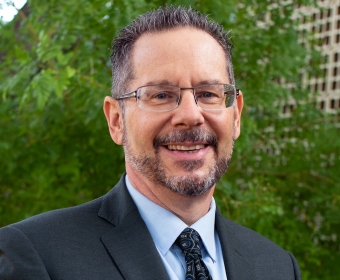 A search committee comprising UTSA faculty and staff and community members initiated the national search for the next dean of the College of Sciences last summer. Campus and community members had opportunities to meet the finalists for the position at a series of forums held in October. “I want to express my gratitude to Dean John Murphy and the entire search committee for their extensive work in this search process,” said Espy. “I particularly want to thank Brad Parman and other partners from UT Health San Antonio and Southwest Research Institute who served on the committee, as well as the alumni and friends of the College of Sciences who took the time to meet with candidates. “Also, I am grateful to Howard Grimes for his continued leadership of the college during this transition,” she said. Grimes, who has served as interim dean since July 2018, will continue in his role until March. The UTSA College of Sciences prepares the next generation of scientists in 13 undergraduate and 16 graduate degree programs offered through seven academic departments: Biology, Chemistry, Computer Science, Environmental Science and Ecology, Geological Sciences, Mathematics, and Physics and Astronomy. Through 10 research center and institutes, the college makes significant contributions in species conservation, nanotechnology, brain health, stem cells, medicinal drug discovery, infectious diseases and vaccine development, and cybersecurity. The college enrolled 5,446 students for Fall 2018.